The Global Dental Consumables Market was valued at $38,921 million in 2016, and is projected to reach $55,584 million in 2023 at a CAGR of 5.2% from 2017 to 2023. Dental consumables include products such as implants, prosthetics, braces, crowns, dental impression materials, and others. They are used for the treatment of dental disorders such as tooth restoration, problems associated with gingival tissues, dental impairments, dental caries, and periodontal diseases. 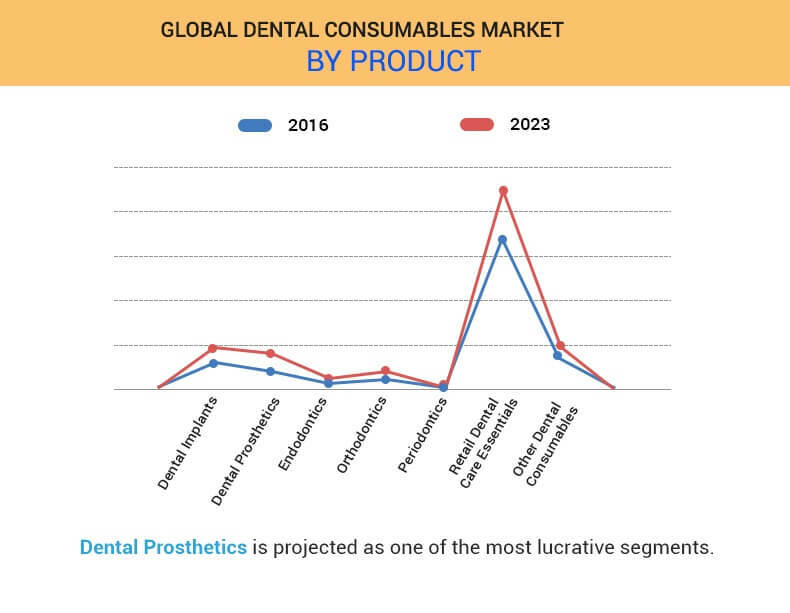 Factors such as rise in prevalence of dental diseases & conditions and increase in geriatric population, which is more prone to dental disorders & tooth loss significantly drive the growth of the global dental consumables market. Moreover, rise in awareness towards oral hygiene, growth in dental tourism, and support from government to promote awareness about dental disorders in the emerging economies supplement the market growth. However, high cost of dental products and limited reimbursement policies restrain the market growth. Conversely, huge untapped market potential in the emerging countries, such as South Africa and India, and upsurge in the demand for dental cosmetic procedures are expected to provide lucrative opportunities to the market players. The global dental consumables market is segmented on the basis of product and region. Based on product, the market is classified into dental implants, dental prosthetics, endodontics, orthodontics, periodontics, retail dental care essentials, and other dental consumables. Dental implants are bifurcated into root form and plate form dental implants. Dental prosthetics are further divided into crowns, bridges, dentures, abutments, veneers, and inlays & onlays. The bridges segment is classified into three-unit bridges, four-unit bridges, Maryland bridges, and cantilever bridges. Dentures are categorized as complete dentures and partial dentures. Abutments is further segmented into temporary and definitive abutments. Endodontics segment is subdivided into endodontic files, obturators, and permanent endodontic sealers. Endodontic files are divided on the basis of material and type. Materials consist of stainless steel files and alloy files, and type consists of handheld RC files and rotary files. Orthodontics segment is composed of brackets, archwires, anchorage appliances, and ligatures. Among them, brackets are of two types, namely, fixed and removable. Anchorage appliances consist of bands & buccal tubes and miniscrews. Ligatures are of two types, namely, elastomeric ligatures and wire ligatures. Periodontics segment is bifurcated into dental sutures and dental hemostats. Retail dental care essentials segment is further categorized as dental brushes, specialized dental pastes, dental floss, dental wash solutions, and dental whitening agents. Other dental consumables comprise dental splints, dental sealants, dental burs, dental impression materials, dental disposables, bonding agents, patient bibs, and aspirator tubes & saliva ejectors. The dental burs segment is fragmented into straight, latch type angle, and friction grip angle handpiece shank. Geographically, the market is analyzed across North America (U.S., Canada, and Mexico), Europe (Germany, France, Italy, UK, Spain, and rest of Europe), Asia-Pacific (China, Japan, Australia, India, South Korea, and rest of Asia-Pacific), and LAMEA (Brazil, South Africa, Saudi Arabia, and rest of LAMEA). The dental implants & prosthetics market is further segmented on the basis of material into metals, polymers, ceramics, and biomaterials. Retail dental care essentials segment accounted for the largest market share in 2016, and is expected to maintain this trend throughout the forecast period. Factors such as increase in awareness of oral health, rise in incidence of dental caries & other periodontal diseases, and growth in number of awareness programs initiated by major players & government boost the growth of the market. For instance, Colgate-Palmolive (India) Limited held its annual dental awareness program, Oral Health Month 2015 (OHM) in collaboration with Indian Dental Association (IDA). Introduction of novel products such as herbal toothpaste & powered toothbrushes and availability of different denture care products & dental accessories by the key players provide lucrative opportunities for the market growth. Rise in focus of vendors on emerging markets, such as Asia-Pacific and LAMEA, is expected to boost the market growth. LAMEA is projected to witness significant growth in the near future, owing to increase in incidence of dental disorders, rise in geriatric population, and government support to spread awareness about oral hygiene. Moreover, high demand for improving esthetic appearance and surge in awareness about these dental consumables are expected to propel the market growth. In addition, rise in dental tourism and various strategic steps adopted by the key vendors to strengthen their foothold in this region are expected to fuel the market growth during the forecast period. Top winning strategies are analyzed by performing a thorough study of the leading players operating in the dental consumables market. Comprehensive analysis of recent developments and growth curves of various companies have helped in understanding the growth strategies adopted by the key players and their potential effect on the market. The companies are evaluated based on annual reports, SEC filings, and press releases. The list of key players profiled in this report include 3M Company, Colgate-Palmolive Company, Danaher Corporation, Dentsply Sirona Inc., Institut Straumann AG, Ivoclar Vivadent, Koninklinje Philips N.V., OSSTEM IMPLANT Co., Ltd., Procter & Gamble, and Zimmer Biomet Holdings, Inc. The study provides an in-depth analysis of the global dental consumables market with current trends and future estimations from 2016 to 2023 to elucidate the imminent investment pockets. 7.8. OSSTEM IMPLANT CO., LTD. The adoption of dental consumables is expected to increase due to rise in various types of dental problems such as tooth loss, edentulism, gingivitis, and others. These consumables are used during dental surgeries to provide relief from the symptoms of dental disorders and enhance the esthetic features of teeth and jaws. Upsurge in cases of dental problems and increase in prevalence of tooth loss make it imperative to use dental consumables for the treatment of dental disorders, which propel the market growth. Moreover, rise in geriatric population, increase in dental tourism, and surge in affordability in the developing economies are projected to supplement the market growth. However, expensive dental products and lack of reimbursements are expected to impede the market growth. The use of dental consumables is highest in Europe, owing to increased awareness about the dental condition and heavy expenditure by the government on healthcare, followed by North America and Asia-Pacific. In addition, dental consumables providers and distributors have focused on expanding their presence in the emerging economies, which is anticipated to drive the market growth.